The Las Vegas Hilton is set back a bit from the north end of the strip, around Circus Circus, The Sahara and The Stratosphere, and so in order to attract people to its casino, rather than to the mega-casinos that line the strip further south, it needs some theme to lure them in. So what has it gone with? The Star Trek Experience, featuring Quark’s Bar. Now, this isn’t as geeky as it sounds – it’s much, much worse! As if a bar decked out to look like Quark’s Bar from Deep Space 9 wasn’t bad enough, they’ve even gone for the whole Star Trek thing with the food and drink. You can buy Romulan Ale, which turns out to be just beer with blue food die, or much, much worse, Belgian Ale, which had an after-taste that ranged from bad chocolate through to burnt wood to just dirt! 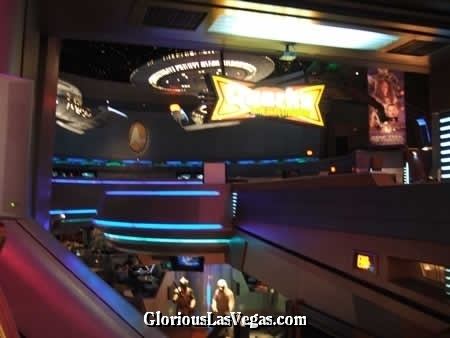 Read more on the Las Vegas Hilton Star Trek Experience (and that’s certainly the word for it!) after the jump. Having the names of beer and food turned into Star Trek sounding names was not only lame, it also made deciding what to eat more difficult, as you had to ignore the name of the food and concentrate on what was in it. As we exchanged glances of incredulity, the bloke at the bar turned to his mate and said “this place is kind of geeky, but it’s cool though!” – Kind of geeky?! This place was the geekiest place I’ve ever been to, and even ranked above my friend’s lounge, with its collection of hand-painted orcs and dwarves and its Star Wars posters!! But the worst was yet to come. It closes at 10pm!! In Vegas – are you kidding me?! This place was so sad, it redefined lame. I can’t understand its point at all. Even when Star Trek DS9 was running, recreating Quark’s Bar was only ever going to appeal to a minority (and certainly not the type of people who would go to Vegas, where there’s sun and lots of other people, including real women – all of which strike fear in the average geek) – but new episodes of DS9 and Star Trek in general have been off our screens for some years now, meaning the Star Trek Experience is getting less and less relevant as every month passes. Now a CSI Experience – I could understand that. A wider variety of people watch it, and it’s very current and very hot. But Star Trek? Oh no, no, no! I shall now have to deny writing this post as I’m certainly going to deny I ever set foot in this place! 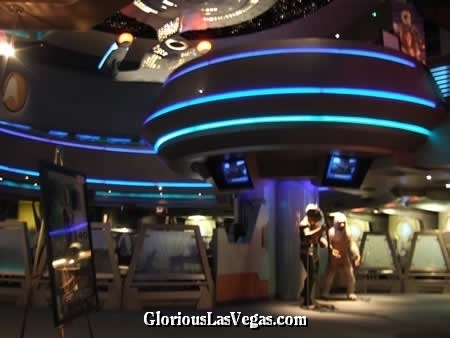 Visit the Las Vegas Star Trek Experience for curiosity’s sake, by all means, but really, with all the fun you can have in Vegas, put it way down your list of things to do. There must be something wrong with you. 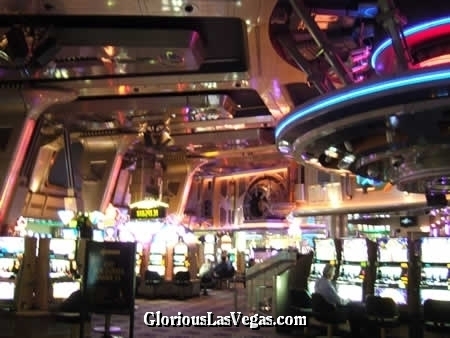 I just got back from Vegas after a weeks vacation, and we did everything any hotel had to offer as far as rides, attractions, playing the slots etc,We hit every Hotel up and down the strip, tackling 7 or 8 a day, and even took a day to go to Hoover Dam, and the best time I had was at the Star Trek Experiance. Sure, they could have done better than Quarks bar, as I was not a big fan of DS9, as it was my least favorite of all the Trek series, but it was a fun experiance. We bought the complete package,which included both rides,as many times as you want to go, a walk through the museum, again as long or as many times as you want, a backstage tour ( The best part of the whole thing by the way! ), a free meal at Quarks, 4, 40th anniversary souivner glasses, and pictures on the bridge of the Enterprise and in a Borg chamber. What a blast the time spent there was. We spent nearly an entire day at this place, and would highly recommended it to anyone, especially a Star Trek fan. Your life must be pretty sad not too have had a good time. And the food at Quarks was quite good. There were four of us, and all our meals were excellent. I had a big glass of Romulan Ale as well. Not the best beer Ive ever had by any means, but not as bad as you make it out to be, and its a must if you are eating in Quarks bar! I must have taken 50 pictures in abd around the Start Trek Experiance, and if I ever get a chance to go back to Vegas again, thats the first place Im heading. You need to relax and enjoy life more. Thats the best attraction in Vegas!! Wow, that told me! Maybe I went when the place was quiet, but it just seemed feeble to me. And the beer – dear god, the beer! Still brings water to my eyes just thinking about it! The Romulan Ale was OK, but I stand by my comment that the Belgian beer on sale at Quark’s tastes like dirt! Anyone else got any opinions either way of Quark’s? I will admit to not trying the Belgian beer you said tastes like dirt. I had the Romulan Ale, and it was not too bad. The food was great, and I would still go back to the Hilton for the Star Trek Experiance and do it again given the chance. We had planned this trip a year in advance, and I was not going home without doing the Star Trek thing. Im a pretty big Star Trek fan which is why I probably enjoyed it so much, but my wife who is not a Star Trek fan in the least even said it was great and was probably the most fun thing we did in Vegas! I did not mean to come down on you like that, but I had such a good time, I could not understand someone panning it like you did. Did you take the back stage tour? That was a lot of fun and probably the best part of the package. Sitting in the Capatains chair on the bridge and getting our pictures taken was pretty cool too. I had to do that, especially since they told us they had actually used that bridge for filming a few scenes! Now when I watch the show, I know I was sitiing in Picards chair. I doubt we could get back out there anytime in the next 5 years or so, as we have a list of other places we want to see, but I will always remember my trip to vegas, and the highlight was definately the Star Trek Exoeriance. As is the case with any attraction, whether you like it or not will depend on your taste. Personally I think the Star Trek Experience is pretty cool. I am a fan of the sci-fi show, (and I am a REAL woman! Shock horror!!) but I’d hardly describe myself as a ‘geek’ for crying out loud, and I personally think you are being rather insulting to the many many people who have visited it. (Given the success of the show, it’s hardly a minority of people who enjoy it) Actually, come to think of it, There have been a few Star Trek Conventions held in Vegas in the past, so I think your point about it not suiting the kind of people who go to vegas is pretty invalid. I have travelled to Vegas from the United Kingdom and stayed at the Hilton many times in the past for business and leisure purposes (6 times in the last 3 years for example) and have had a look round this attraction pretty much each time. Quark’s bar serves great food and drink. Had you tried the Warp Core Breach by the way? All in all, the Experience does not merit such a panning, It was a brilliant attraction, Which due to (as you said) it being a little dated has now come to a close unfortunately. When I’m back there in November I hope I can still get a Warp Core Breach though! Well your journalism is nothing but biased, and sounds more like chest pounding insults than an actual review, but I’m sure you’ll be happy to find out that the experience has been closed down. Just more proof that truly evil things flourish while all that is good in the world gets burned for daring to stand out. Up yours, sir, and may life be cruel to you.